I love the Build A Figure concept. Since I'm generally a completist, it's almost like I'm getting something for free - almost. And when the right character is chosen, particularly the larger, more impressive ones, all the better. 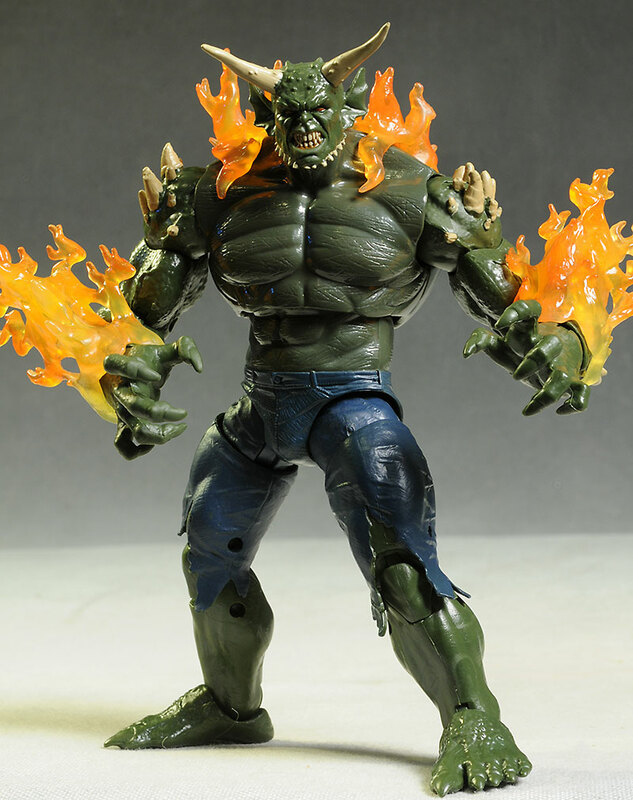 It's not just Marvel Legends that employs the BAF, and they certainly didn't invent it. Other companies do figures, play sets, dioramas - if you can do it, it's been done. 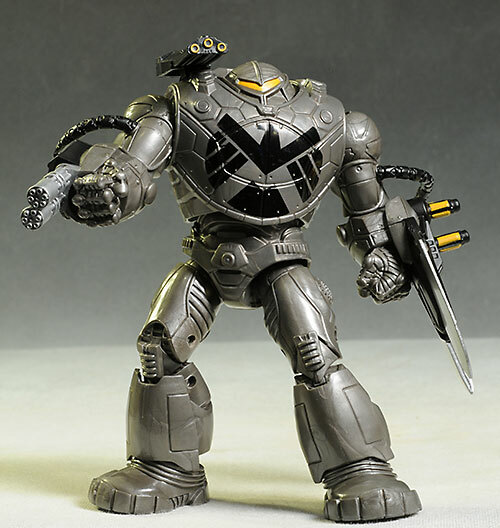 But Toybiz and then Hasbro made it a mainstay in the action hero market with Marvel Legends, and they continue the tradition with the great success. Their three pseudo movie ML series released so far this year - Captain America, Spider-Man and Guardians of the Galaxy - all have a BAF. Rather than do them individually I figured I'd hit them up as a trio tonight. 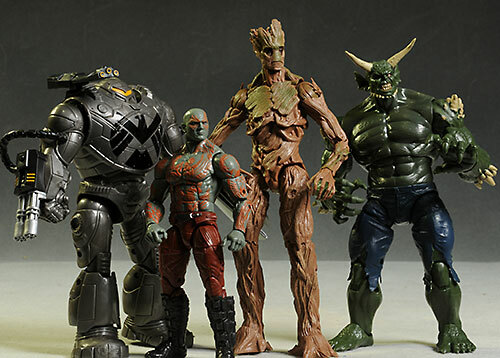 For the Guardians, Hasbro selected the largest member of the team to be the BAF - Groot. Since coming up with accessories for this guy would have been tough, and since he is the biggest, it makes complete sense. 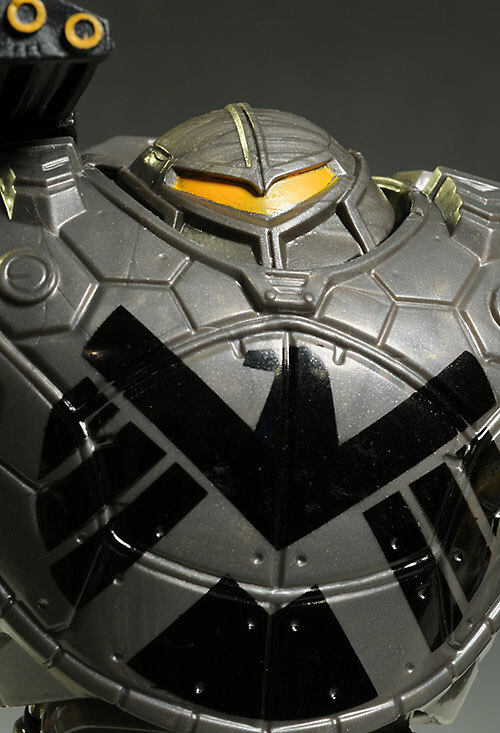 Under the Captain America license, they went with the robotic Mandroid. 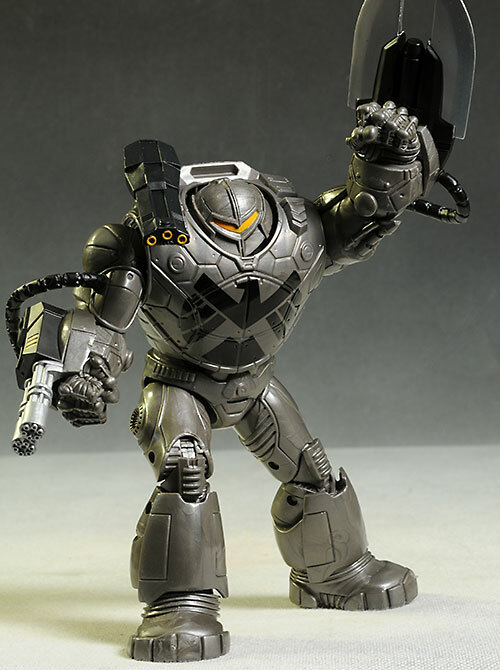 We've never seen this particular comic styled version on screen, but we did get a bunch of robots that were sort of, kind of, Mandroids in Iron Man 2. Finally, there's the Green Goblin with the Spider-Man series. 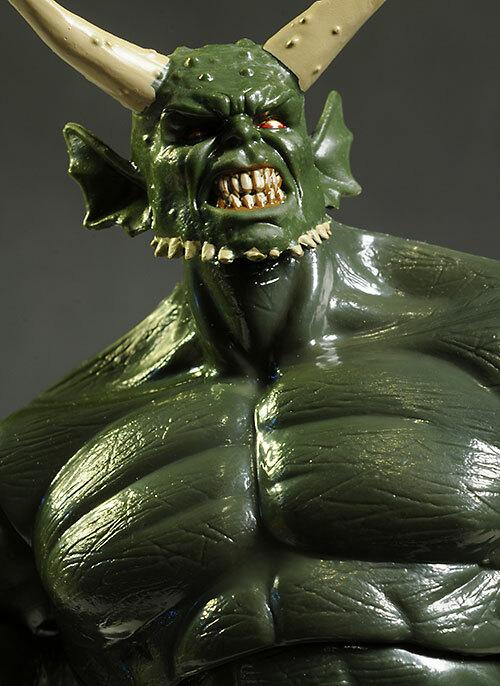 This is the Ultimate version of the Green Goblin, so if you were looking for something a bit more classic, this ain't it. As usual, you create these figures by buying all six figures in each wave, and while it's getting tougher to find Black Cat and Black Widow, it's still possible to complete all three of these right off the pegs. I have to give Hasbro some major props here - these are the only mass market toys out there right now with completely collector friendly packages. You can open these up - carefully - without even cutting a piece of tape, slide the tray out, remove the figures and accessories, and put it all back together later, no muss, no fuss, no damage. While there aren't any twisty ties or rubber bands (yea! ), there are a couple pieces of tape holding the smaller accessories safely in the plastic tray. You can ditch the tape however, and the accessories will remain in place under normal handling. I didn't include a package shot this time, but you can always reference back to the earlier review of the Guardians. I'm not a regular reader of the Ultimate titles, but I gotta say that I'm digging this Hulked out Goblin. And the comparison to the Hulk isn't merely because of his size - you should recognize that torso and those pants wearing legs, since they have been re-used from an earlier Hulk figure. The expression is snarling and mean, with some excellent detail work on the mouth and spikes. Overall it's a cool design, and it's a very different look for a classic character. Mandroid is sweet as well, particularly if you like robots. The detailing is appropriate for a metal exterior, and his size fits in nicely with the normal ML Iron Man. Remember, these are all done in a 6" scale, but that makes them all larger than 6". 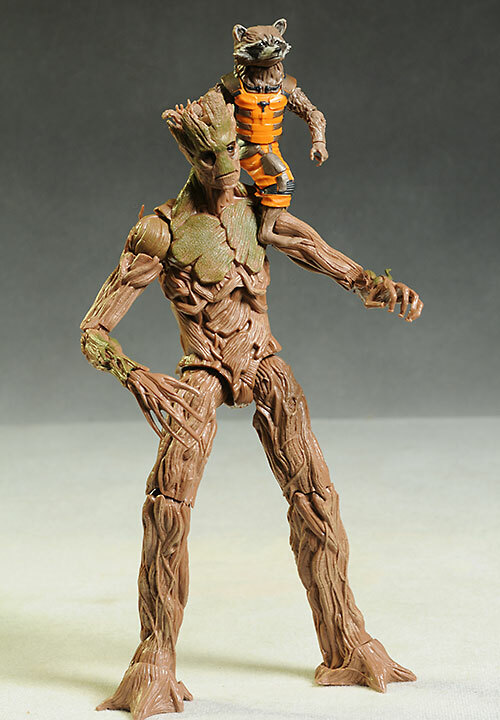 For example, Groot comes in at almost 9" tall! Goblin and Mandroid are between 7" and 7 1/2", making them much larger in height (and volume) than the normal ML figure. They might pale in size when compared to some early BAF"s (see the last photo for an example), but they are still hefty figures. 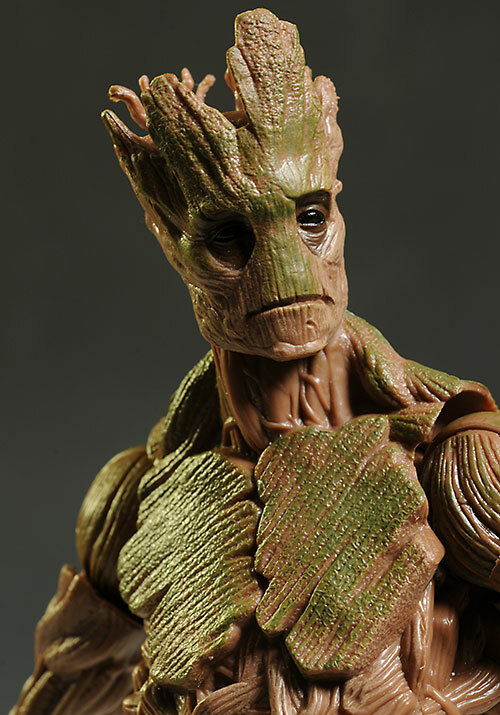 Groot has the most overall detail, with a very cool texturing on his bark exterior. Trees and plants are always very difficult to do with realistic texturing - it often comes off heavy handed or cartoony. Not so this time, and Groot matches up with his on screen look pretty well. The paint work is well above average for a mass market release, although there isn't a ton of small detail work on any of the three. Green Goblin has the most, particularly around the teeth and bony protuberances. Groot has the least, with an all over brown broken up with just his eyes. Mandroid falls in between, and I love the chest logo. All three have a nice consistency to the major colors. These are Marvel Legends figures, and that means (usually) great articulation. Green Goblin is my favorite of the three. The pin/disc style ball joint at the neck works better than usual, with some good tilt and lean action. The ball shoulders and hips, as well as the double pin knees, pin elbows and ankles, cut biceps and thighs, and cut/rocker chest and pin/rocker ankles all work terrific. Mandroid is very similar, but lacks the wrist and thigh joints. His neck isn't as easy to work with either, since the true ball is very deep in the armor. 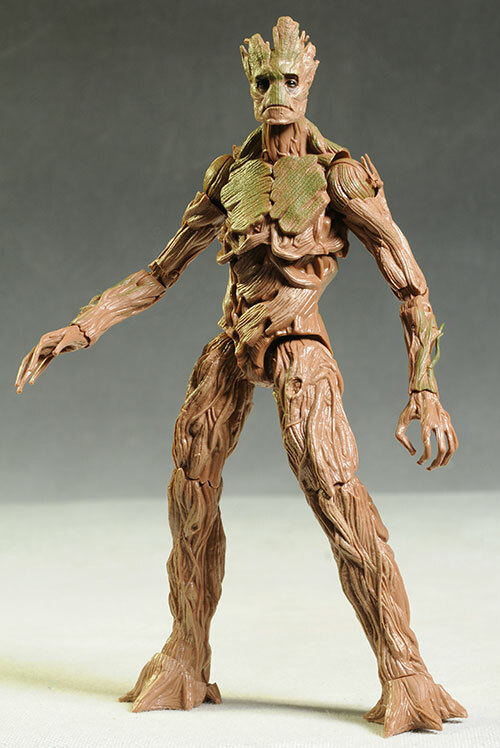 Groot is also nicely articulated, especially when you consider the tree bark design. He lacks the cut thighs, his knees are only single pin, and the ankles don't quite have the mobility of the Goblin's, but you'll still be able to get some very nice poses out of him, including deep stances. When it comes to BAF's, it's normal and completely acceptable for there to be a big old Bupkis in this category. They are themselves accessories, after all, and getting anything extra with them is not the expectation. Therefore, any score here - even a half star - is a big plus. Groot doesn't come with any extras, as expected. No problem there, but it's worth noting. Mandroid has his removable black cannon that attaches to his right shoulder. You can ditch it if you prefer the slicker look. 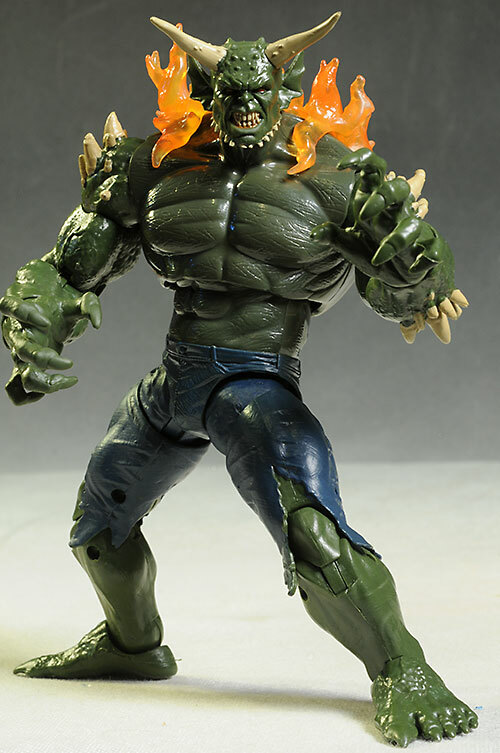 Green Goblin actually comes with three extras - his flames. There's one for each arm, as well as one that drapes over his shoulders and back. These are made in a translucent orangish/reddish plastic, and add a nice devilish look to the overall design. The back flames fit nicely, but I did have some trouble getting the arm flames to attach and rest properly over the forearms. Not a big deal - I finally found a look I liked - but more work than you'd expect. 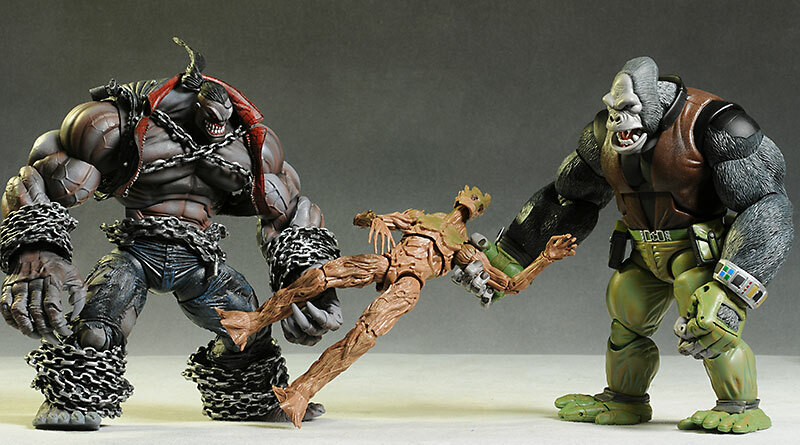 All three of these are terrific action figures, with excellent sculpts and articulation. The large size makes them ideal when battling the smaller ML's in the sandbox, and adds some variety to the collector's display as well. This is an interesting category for a BAF. The only way to buy them independently is on the secondary market, where prices fluctuate daily. To buy them at the store, you have to purchase an entire wave of Spider-man, Captain America, or Guardians of the Galaxy for a whopping $120. If you don't care about the other six figures, that's a lot of money. However, there's another way to look at it - these figures are 'free'. If you're already buying the six figures, you're getting these as a bonus. That's the two extremes - either you wanted all six and the BAF was a freebie, or you only wanted the BAF and it cost you $120. I'd guess 80% of collectors will fall someplace in between, and it will vary with each figure. For example, if you wanted Groot, you probably wanted Rocket, Star-Lord, Gamora and Drax. Nova and Iron Man? Well, it's unlikely Nova will be wearing that costume in the movie, and even less likely we'll even see Iron Man on screen (although we haven't heard much about the end credits yet...), let alone in the comic based armor. Picking up those two depends more on your desire for the comic versions, making Groot a $40 purchase for a lot of people. In the end I went with a slightly below average score, based on my desire for the various figures in each of the waves. Your mileage is going to vary, and vary quite a bit. I've always loved the BAF concept, so I tend to skew towards loving the BAF's as well. But this time out, that love is well deserved. Hasbro has done a nice job with all three of these, sucking me in even with a character like the Ultimate Green Goblin. I had no intention initially of buying the full wave of any of these lines, but these damn BAF's were just too sweet to avoid. And in case you forgot how great BAF's were in days gone by, I included the final photo so Pitt and Monkeyman could remind you. You're best bet is your local Toys R Us, Meijers or Target. You can still pick up complete sets of these, although the easiest is Groot, of course. The other two are getting tougher, due in large part to fewer Black Widow and Black Cat figures being produced. You can always go the direct route and buy completed BAF figures of ebay. I checked out the complete run of Guardians of the Galaxy figures here and here, but the other two waves I pretty much missed reviewing. I did do two of the Spidey figures however, but for some reason never got around to finishing that wave or doing the Cap wave. I've covered a lot of previous ML's, including part of the recent Iron Man series, the Arnim Zola series in three parts: here, along with Part 2 and Part 1. Before that, I covered the Terrax BAF wave, in part 1 and part 2; the Red Hulk set, in part 1 and part 2; the last wave of 'icons', the larger scale Legends; the Foom/Hulk wave, broken into one review here and another here; I also covered the early Hasbro ML's, incluidng wave 2 (with a second part here) and wave 1, first at MROTW and then at QSE. - Earlier Hasbro Marvel Legends Icons included Punisher and Doom, and my favorite, Thor. - in the 12? Icons line, there’s Spider-man and Beast, Wolverine and Venom.